Indianapolis, IN, 5/3/16 — Rhythm! Discovery Center has launched a new interactive website, allowing visitors to learn more about the museum’s history, navigate and explore current exhibits, and engage in educational enrichment opportunities. “I am very excited to announce the NEW Rhythm! Discovery Center website. Visitors will now experience a vibrant, fun, interactive website, with much easier navigation to the many pages of information and resources. 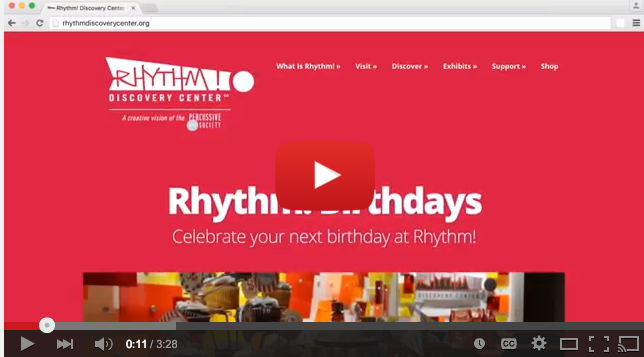 I personally invite everyone of all ages to explore our new website and to visit us in person the next time you are in downtown Indianapolis - We'll help you discover your rhythm!" — Jeffrey Hartsough, Executive Director. Learn, Discover and Find Your Rhythm!™ by navigating through media-rich pages and exploring online archives. About Rhythm! Located in Downtown Indianapolis, Rhythm! Discovery Center is the world’s foremost drum and percussion museum; founded by the Percussive Arts Society in 2009. Rhythm! features unique, interactive exhibits highlighting a rich collection of historic artifacts and hands-on percussion instruments.